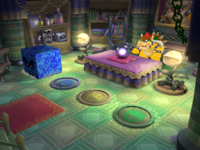 Seer Terror is a Rare minigame in Mario Party 6. Its title is a portmanteau of "seer", another name for a fortune teller, and the phrase "sheer terror", meaning "great fear". 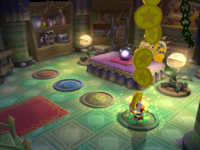 It is an extra minigame that can be purchased at the Star Bank for 50 Stars. 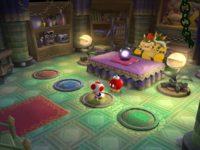 Bowser welcomes the player into his chamber, and states that he can predict their future. The camera zooms out to show most of the room, and, as the announcer says, "Go! ", four ropes fall from above. 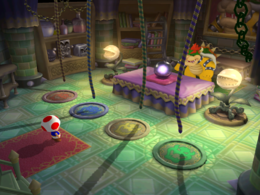 Bowser instructs the player to select one of the four ropes and pull on it, so that he can predict their future. They have ten seconds to do so. 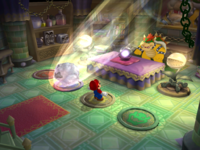 A random event then occurs, most often being something that harms the player. "You're going to have a blast! GWAHAHA!" "I see an event of explosive proportions in your future! Gwahahahaha!" "I see a LARGE pet in your future! Gwahaha!" "Trouble will follow you wherever you go! Gwahahahaha!" "Your day will be...sharp and pointy! Gwarrrharrr!" "I predict you will soon be in a prickly mood! Gwarrrharr!" "The weather today will be very, very HOT! Gwahaha!" "You'll soon rekindle an old flame! Gwahaha!" "The sky will fall! Gwaha!" "Something very surprising is bound to happen to you! Gwarrrhaha!" "You can expect a great financial windfall. Grrrr!" "You'll have a very rich life. Grrr, a loser like you doesn't deserve good luck like that!" "I predict that you'll soon fall head over heals..."
"Your mood will plummet... Gwahahaha!" "Your life is about to make a big turnaround! Gwahaha!" "You'll play so many games that your head will spin. Gwahaha!" "Your back will ache from all the good fortune you'll be carrying! Garrharr!" "Tomorrow will be the best day of your (miserable) life! Gwaha!" "Fungus. 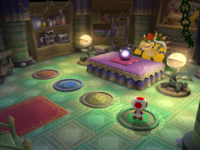 I see fungus in your future...mushrooms galore!" "I hope you like mushrooms, because I see lots of them in your future!" "I predict that you will soon feel very...depressed! Gwahaha!" "You'll feel crushed by stress! Gwaha!" "I see financial DOOM in your future! Gwahahahaha!" "I see your wealth going to someone more deserving! GWAHA!" "Bad things are in your future. Learn to ROLL with it! Gwaha!" "You feel confined by the pressures in your life! Gwahahaha!" "I see that you'll easily leap over any problem! Gwarr!" "You will soon be able to rise over life's obstacles. Just don't get used to it! Grrr!" "Something unbelievable is bound to happen to you!" 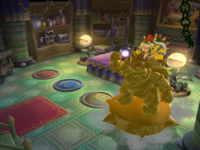 Bowser head bomb A Bowser head bomb drops and explodes, blackening Bowser. 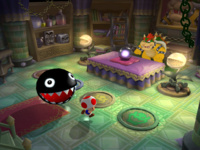 The player runs away. "Your destiny has rubbed off on ME! ARGGGGGG!!!" 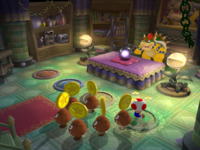 Bowser gives the player their fortune, which if it is a bad fortune is a one-liner based upon the event that just occurred. If it is a bad fortune, he laughs at their expense. If it is a good fortune, he looks away in disgust. 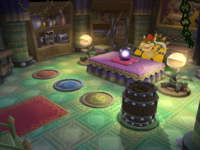 If it is the meteorite or Bowser bomb fortune, Bowser pumps his fist. If it is the black hole fortune, Bowser yells as he is sucked in. 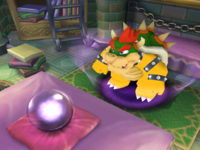 Rules – "Bowser will peer into his crystal ball and predict your future! All you have to do is choose a rope and pull on it." Advice – "There are good fortunes and bad fortunes...which will yours be?" 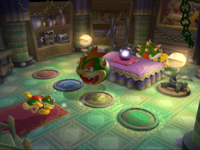 Falling basins are a popular motif in Japanese slapstick comedy which likely led to their inclusion in this minigame. 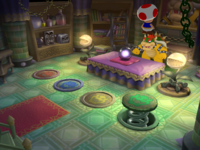 In the info box for this mini-game, Bowser says the phrase "Ahh...I can see your future...and THIS is what I see." just before a giant Bowser statue falls on Luigi. 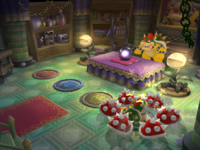 Bowser never says this phrase when playing the minigame itself, instead saying the phrase "Ahhh...I can see your pathetic future! 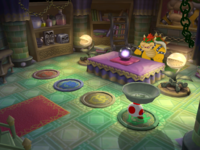 It's all coming into focus..."
When the player falls down the pit, Bowser might say "I predict you will fall head over heals..." However, the idiom is actually "head over heels". This page was last edited on September 17, 2018, at 07:53.